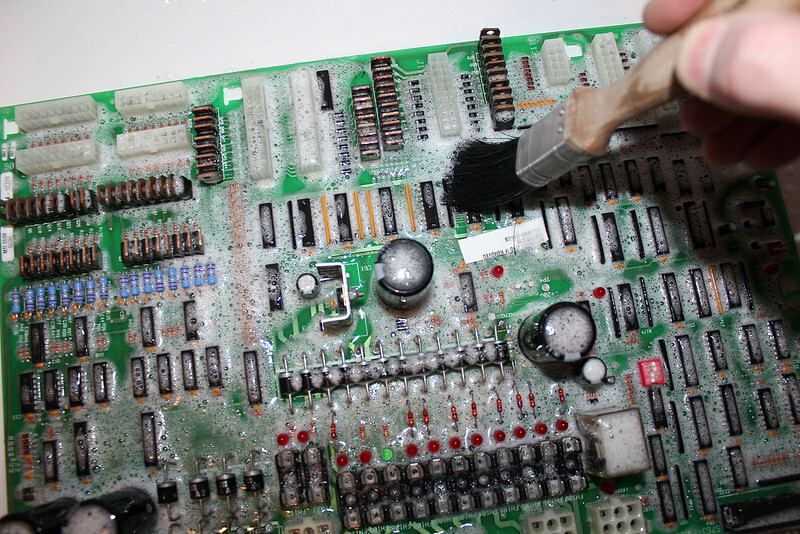 Pete's Guide: Cleaning Circuit Boards like a Boss! 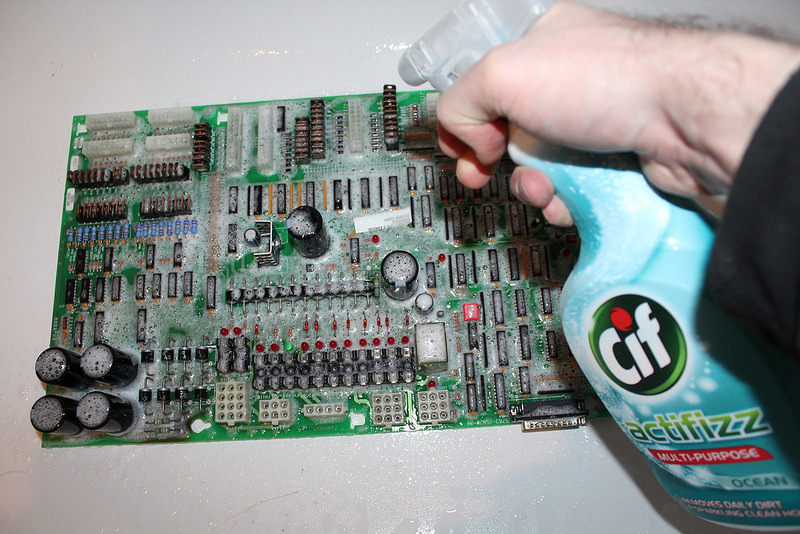 All over the interwebz, I keep seeing people spending 20 hours cleaning circuit boards with cotton buds and alcohol. Ain't nobody got time for dat, and it's getting a little painful. So here's my process for super cleaning boards quickly and easily. Step 1: Take some dusty junk. 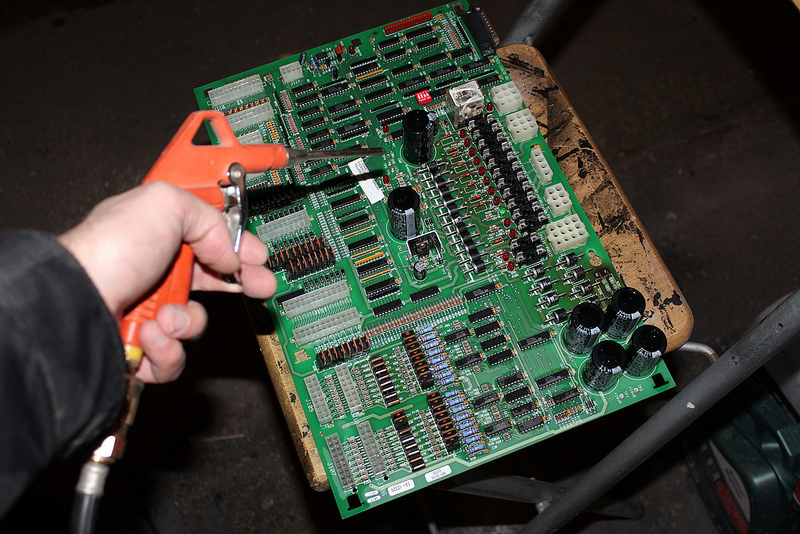 Step 2: Remove socketed chips and fuses, then attack it with a cleaning solution. I like this Cif Actifizz stuff because it's gentle and smells lovely, especially the Ocean one. Step 3: Using a clean paintbrush, give it a tickle. No scrubbing required, just agitate. Labels should be perfectly safe. Step 4: Thoroughly rinse it off. Step 5: Accelerate the drying process by blowing it off with compressed air. Be as thorough as you can. 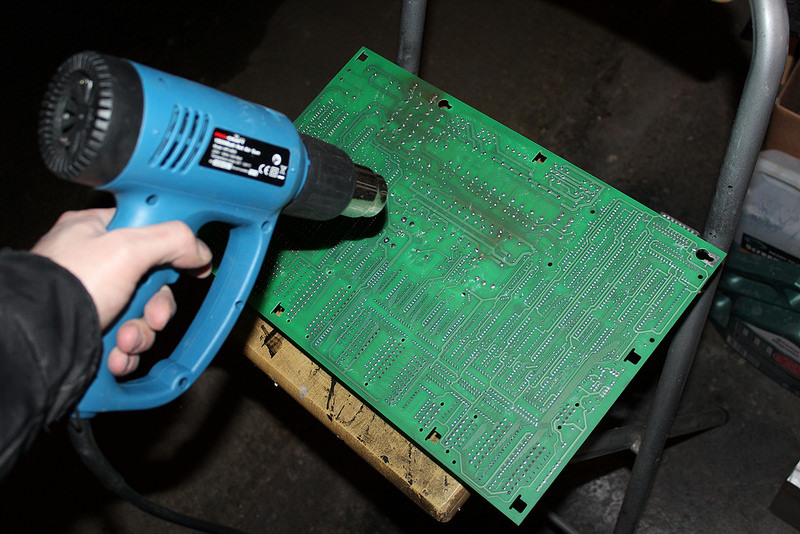 Step 6: OPTIONAL - I like to accelerate further by using a hot air gun (or hair dryer) by warming the back of the circuit board. Keep a safe distance, the rule of thumb is if it's too hot for your hand then you need to back away. A few minutes on this should be fine. Step 7: You're done. Leave it alone for another 24 -48 hours at room temperature before reinstalling or using. You now have a super clean board. 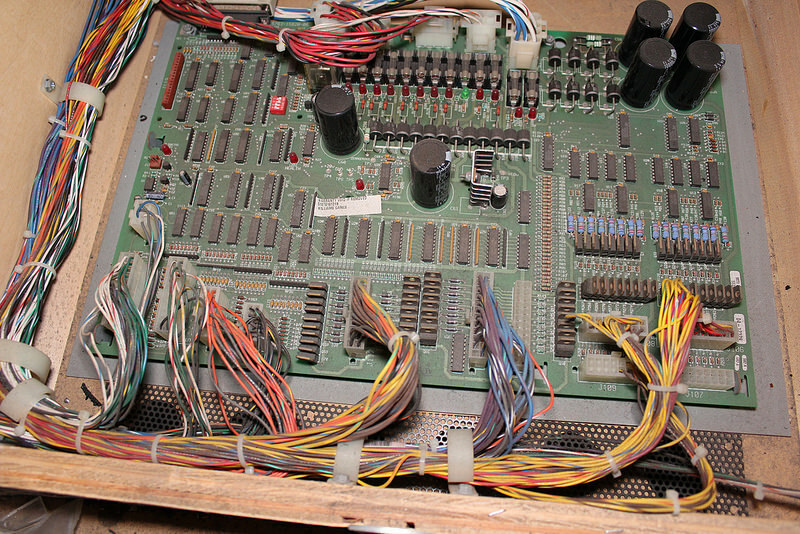 Reinstall your chips and fuses. The whole process should take no longer than 15 minutes and you score extra life points if you do a whole bunch of boards at once. Is that condensation in the relay ? Yea I use isopropyl alcohol for cleaning boards. Its just as fast and evaporates very quickly, especially with an air line. Well that is why you should dry it thoroughly as per my guide and then leave it for another 24 -48 hours. HOWEVER, any chips with hairline cracks will have failed or are failing and should be replaced. Capacitors contain liquid anyway so if they're leaking stuff in, they'll be leaking stuff out. Replace, replace, replace. It's all part of board servciing. Nah, it's fine. Dust has far more 'deposits' in it. Plus blowing it off with compressed air should eliminate most of that. Yes. Because the board was just washed. That's why I said leave for another 24 -48 hours. The condensation has completely gone since I posted this. I've washed 100's of boards this way - pinballs, computer motherboards, tv circuits, audio equipment, you name it. Never once had a problem, ever! And remember at the PCB manufacturing plant circuit boards are dipped in and out of fluid tanks all the time. It really isn't an issue. Everyone using alcohol just tilted and lost your bonus points. Because it's more expensive than water haha! Only joking really. If the end result is the same then who cares. As above. Follow these guidelines and you will be rocking and a rolling. Done similar stuff for ages and never had an issue. The trouble with water is it takes ages to dry. Isopropyl Alcohol evaporates quickly at room temperature and more or less instantly if you use an airline, so you can put the board straight back in your game and play on it. Also 100% pure IPA doesn't conduct electricity so you could run the board live in a bath of it if you wanted. Most often its diluted with distilled water though but 91% is easy to find and inexpensive. Actually using a shower to wash boards just looks all wrong but like Pete said boards go through all sorts during manufacture and are actually quite robust. Another couple of ways to speed up the drying process: stick it on the top shelf of the airing cupboard overnight or if you've got an electric fan assisted oven set it going on the lowest temperature (I think mine kicks in at about 50-75'C) and pop it in for an hour or two with the door slightly ajar. I always use IPA for the final flush because I live in an area with hard water and it seems to leave limescale marks otherwise. I live in an area with hard water and it seems to leave limescale marks otherwise. If you have a compressor then blowing off the water should eliminate that. I would really like a compressor. I may get a reasonably substantial one for an airbrush. I don't have the need (or space) for an industrial one to run tools but an airbrush compressor has enough puff to blow things dry! I've cleaned boards both ways i.e. as per the post and with Isopropyl Alcohol and both methods have been fine. To be honest nowadays I tend to stick with Isopropyl Alcohol because of speed. When I did use water i would leave the boards in the airing cupboard for a couple of weeks. I always use compressed air too. Is this good enough for taking acid/alkaline off a board or do you need to also add a stage of vinegar ? 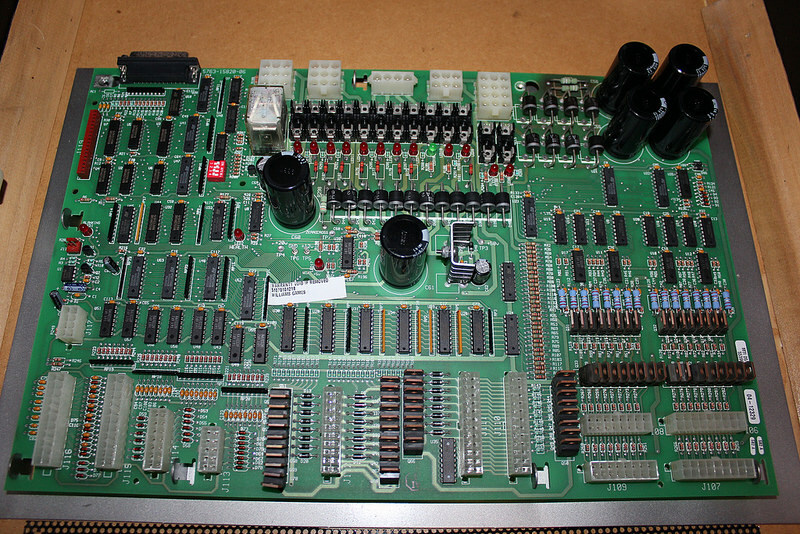 Swapped out the CPU board on my Star Trek TNG which has had an alkaline leak on it - going to clean the board out and don't want to cook it. This thread describes cleaning off years (or decades) of general dust & gunge build up. If you have battery damage you need to neutralise the leaked alkaline (at least) and then replace/repair whatever has been affected in the vicinity of the leak. There's lots of information online regarding this matter. Water is fine as long as you commit to drying it out properly, the blow-dry and sit stages are not just a good idea, they're critical to make water baths safe. If you are impatient and need to get something working right this second, go for the isopropyl alcohol. Corroded boards, this will do nothing except make your life worse as rust surfaces take on water and produce more rust no matter how fast you dry it off. I wait for the wife to go out and put them through the dishwasher. Does she live in the dishwasher? nice to see transistors, capacitors and resistors in neat uniform straight lines and all standing to attention too, unlike most boards that have been worked on in the past. Err, have to admit, it was me who actually bent them back into a straight line. 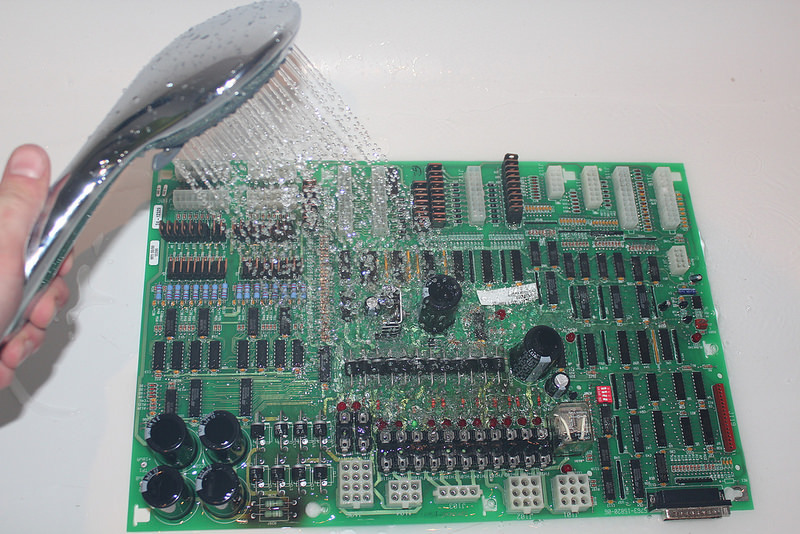 What about a circuit board with infrared optos like for a drop target, is it safe to clean them with water as well?